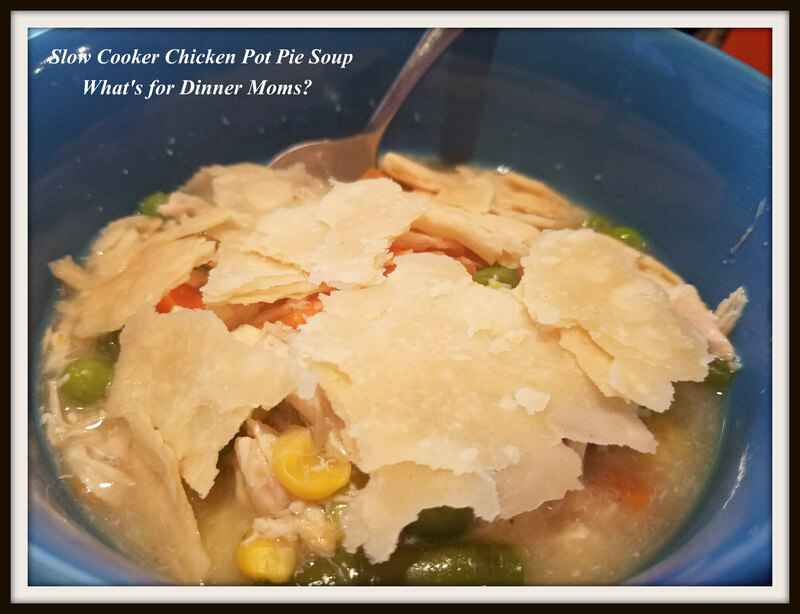 Slow Cooker Chicken Pot Pie Soup – What's for Dinner Moms? Breathe. Breathe. This is the mantra I keep repeating to myself all day. We are trying to keep things super simple right now. It seems that every year the schools, lessons, and classes try to pack more and more into May and the first week in June. Every class seems to have a recital or presentation, every school seems to have some type of ceremony and orchestra concert, plus umpteen extra rehearsals for each of these. Needless to say things are insane! I need to depend on my slow cooker more and more. I also want to keep meals simple and this one is SUPER simple! Plus this is such a great comfort meal when the rest of the world seems out of control. My kids love this soup (you can make it even more stew like if you want) because of the pie crust crumbles on top. It made it seem like a real chicken pot pie without all the work! It was fun for them with the pie crust topping. I served this with a side salad to complete the meal. Place chicken breast and chicken stock into the slow cooker on low for 6-8 hours. Once the chicken is cooked through add vegetables to slow cooker for about 1 hour. Mix 2 OR 3 tablespoons of corn starch with 2 OR 3 tablespoons of cold water to make a slurry (corn starch will melt into the water). Add to slow cooker and turn on high for 15-20 minutes. The more corn starch you use the thicker your soup will be. When you add the corn starch to the slow cooker bake your pie crusts on a rimmed baking sheet (unroll into circles before baking) according to package directions to lightly browned. Cut with a pizza cutter after removing from the oven. Serve soup with pie crust sprinkled over the top as desired. I am a fan of pot pie. You’re right about it being a comfort food. Hang in there with all those end of school year events! Thank you, Sylvester! I will. Yum, I love that. I need to try it on a weekend once.